So, I recently attended a talk given by Ben Henderson on Xamarin and was pretty impressed with what I saw. Now before I get to far into this post let me introduce my self. My name is Christopher Gordon, a Software Developer with a strong interest in mobile development. Over the last 3 years I've been dabbling with the Android framework. I, along with Frank Jones and Noah Porch, currently have an application in market named Kickback. We would like to develop a iOS client but neither of us have experience with iOS. This is were I think we could definitely benefit from Xamarin. Xamarin allows you to develop a code base that can be shared between multiple platforms (Android, Windows and iOS), which is great for teams of any size. But for me the biggest benefit was that I could write the majority of my code in C#, which I am very familiar with, as opposed to Objective-C. This alone would flatten the learning curve tremendously and allow me to become more productive, faster. There is however one caveat to developing for iOS, and that is you MUST have a Mac in order to code the UI. Hey, I don't make the rules I just break them! I plan to use Xamarin to rewrite the majority of Kickback so that I can leverage it's power to create an iOS and Windows Phone client. As with any awesome thing comes the price. 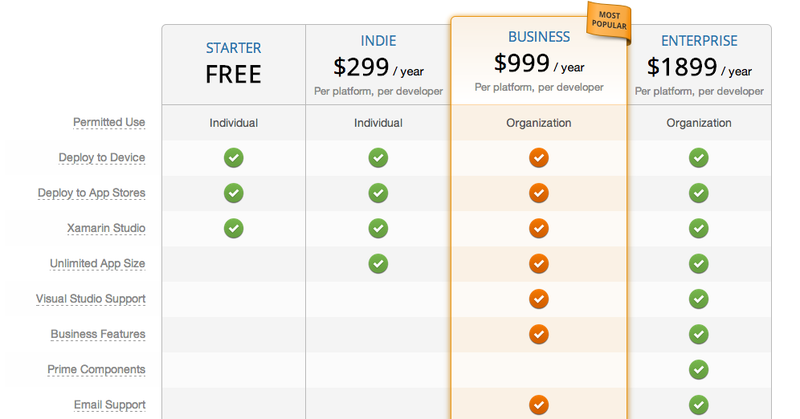 For serious development, the Indie package looks like it has what you will need at a minimum. 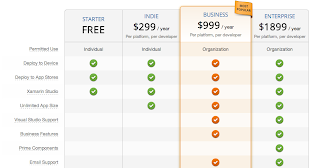 Me personally, I would like to have the Visual Studio integration which will run a whopping $999/year. But, before you go out and spend tons of cash, you can always install the starter version to see if Xamarin is in fact as awesome as it claims to be. I plan to blog about Xamarin (good or bad) as I venture into the belly of the beast. If there are any Xamarin users out there feel free to leave a comment to let me know how you feel about Xamarin. I'm curious to hear what others think.